Mainly the US, as one would expect. 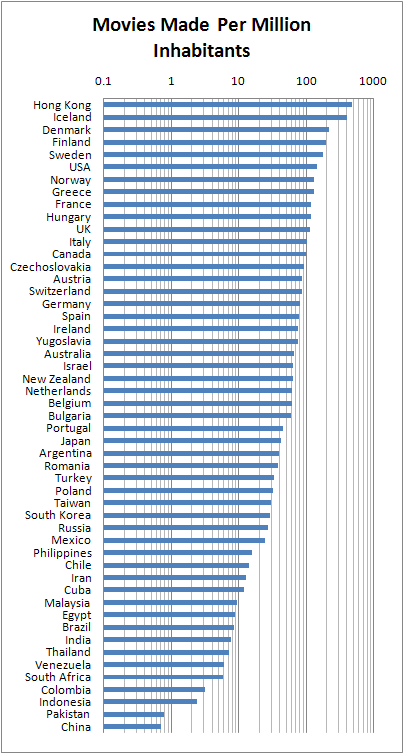 As in the post What Are Movies About, I looked at the IMDB databases to find out in what countries movies get made. I took their list of titles and removed works marked as Adult, Documentary, News, Game, and TV. I also removed titles with less than 5 ratings votes, since there’s a lot of unwatched stuff in there, especially in recent years with the rise of cheap digital cameras. The Scandinavians seem to really like to make movies! Iceland, Denmark, Finland, Sweden and Norway are all way up there. Long winter nights resemble sitting in a dark theater, I suppose. Finally, how has the number of movies made changed through the years? The US movie industry really slumped in the mid-50s when television came in. The Russians got hammered when they lost their empire in the 90s. 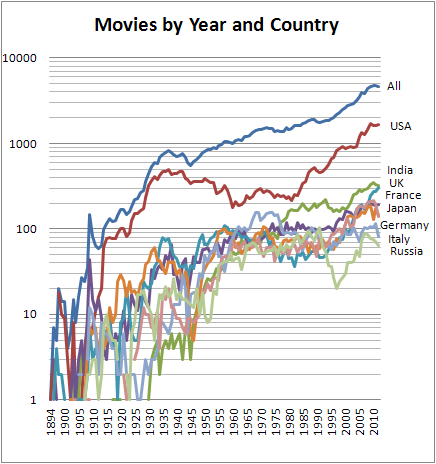 It’s a bit hard to see, but France actually made more movies than the US before WW I, when they became otherwise occupied. Ditto Germany and Japan in the 1940s. Today about 4500 movies get made world-wide each year, about 12 a day. Here – Movie_titles_2012 – is a list of all the titles for 2012, sorted by the number of IMDB votes for each. At 1.5 hours each, you could just barely see them all if you spent every waking hour watching and only got 6 hours of sleep. That’s pretty infeasible, but it would be possible to see all of the 1600 US movies made each year. That’s about 4.5 a day, but that would be a severe test of sanity! 8 Responses to Where Are Movies Made? The fact that you researched this boggles my mind. And the off the wall charts; it absolutely tickles me to bits. Not only that, but relieves me from the worry that my own petty obsessions will overtake me. I can’t compare. Should you decide to go at some other topic, I’m certainly up for the read. Thanks. Have you considered that the Tamil, Hindi and Punjabi film markets are all w/in the Indian film market? Normally I find Hindis listed on IMDB (though I do wish they would show more consistency and interest in using the site as a tool), but Tamil movies not so much. As for the Punjabi film industry, I’m uncertain. It would be interesting to see how Indian films break down by region, but I don’t think IMDB would be much help, since their only region keyword is the country. Even the language wouldn’t help much, since many films appear to be released in several Indian languages at once. Perhaps there are more detailed databases in India itself. Thanks for pointing to that page! I don’t know where they get their numbers from, though. The number for India, 425, looks like the production in one year, but the number for the US, 9834, is way too high for one year. The worldwide gross for US movies, $404 billion, is also way too high. Both numbers look off by a factor of 10. They do say that this is the beta version, though.